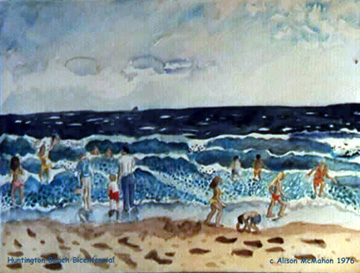 The piece above is a watercolor painting done on the fourth of July in Huntington Beach the year of the United States Bicentennial. It was strangely uneventful and low-key. Now, twenty-one years later, it seems like it was a time imagined, but it wasn't. When I returned to California, I found that, not only had the beachfront area been deco-ized, but "Huntington Beach 4th of July" meant riots to most people, but to me, it always meant a beach close to Long Beach where I could go alone, have chips and salsa and summer salad, and lie on the beach with a book or paints, undisturbed and peaceful: most definitely a separate reality and I don't know how it came to be. 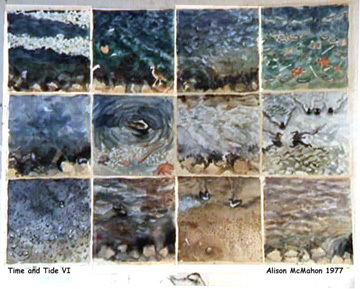 This is one of my favorite watercolor panels from the "Time and Tide" series because of the duck waterballet that takes place on the high tide after a rain. The panels were random--12 to 24 squares in each, the colors of which were determined by the weather and the moon. I sat out a Long Beach run and did these two little watercolor sketches of South Bay/Santa Monica Bay on location in Palos Verdes. Since they were painted simultaneously, from the same point, they fit together when done.